RDD Kerala VRP, BRP Admit Card 2019: Rural Development Department, Kerala is going to organize the Block Resource Personnel and Village Resource Personnel written test in the month of May. All the hopefuls applied for BRP and VRP posts in Kerala must get ready to attend the examination as per the scheduled dates. Aspirants applied for RDD jobs have to download RDD Kerala VRP BRP Admit Card 2019 to attend the examination. Hall ticket/admit card is the most important document required to attend the examination. The exam invigilators will verify the admit card of the candidate before allowing him/her to proceed with the test. Candidates who fail to show the admit cards at the time of verification will not be allowed to take part in the examination. Hence all the hopefuls applied for RDD Kerala VRP posts must download and keep the hall ticket safe to carry to the examination. Applicants can download the hall tickets from RDD Kerala websites, socialaudit.kerala.gov.in or rdd.kerala.gov.in. By tapping on the corresponding link the hall tickets can be downloaded. Rural Development Department (RDD), Kerala is the state government wing working for rural development related works. This organization notifies various jobs based on the requirement. Recently, RDD Kerala announced 2921 Block Resource Personnel and Village Resource Personnel jobs. Many of the candidates having a suitable profile to apply for VRP and BRP posts have applied during the application dates. The organization received lakhs of applications from interested and eligible aspirants. The selection of suitable candidates will be done through the written test and interview rounds. Finally, aspirants who clear the selection rounds with good merit will be shortlisted for the RDD Kerala jobs. The RDD Kerala will be conducting the VRP written test in May 2019. The examination is going to be conducted across Kerala state. Aspirants can check the exam date, timings, and other details from their respective admit cards. Hall ticket/admit card is the most required document to carry to the examination. 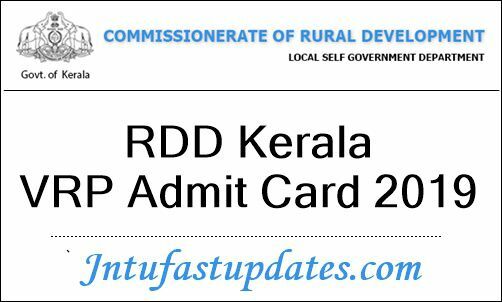 Aspirants have to download RDD Kerala VRP BRP Admit card 2019 from the official website, rdd.kerala.gov.in. The hall ticket will be accessible before 10 days of the examination [Tentatively]. Candidates can check all the details once after downloading the admit cards. For any corrections, in any of the columns, candidates can approach the RDD Kerala authorities through email or phone. The officers will check the request and re-issue the admit cards to the candidates. Candidates have to attend the examination at their allotted examination centers. Report before 30 minutes of the examination to avoid the risk. Candidates must have to carry the hall tickets without fail. And also it is important to carry any of the valid identity proof copy along with the hall ticket. Or any other valid ID proof. Search for ‘Kerala RDD VRP BRP Hall ticket 2019 download’ link on the homepage. Click on it and specify the required details. Check all the details once and take a printout, keep it safe to carry to the examination.